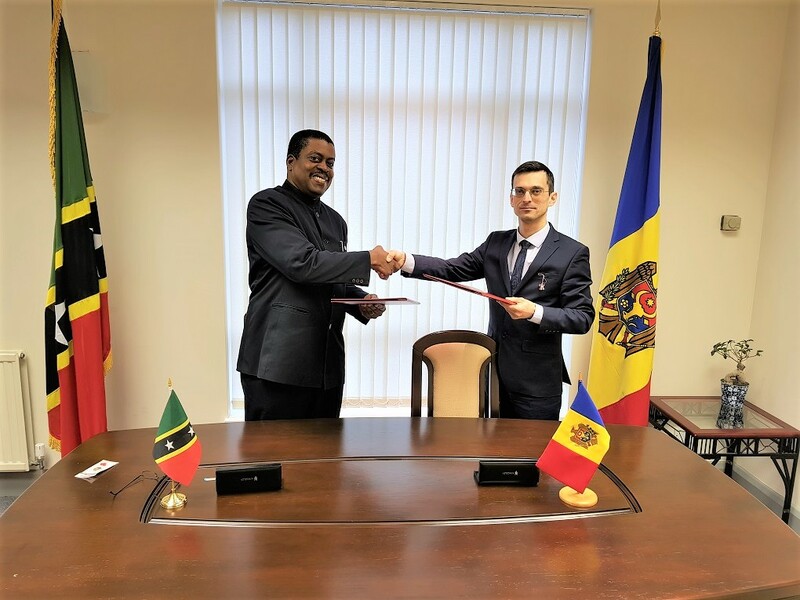 London – Through their respective diplomatic envoys, the governments of St. Kitts and Nevis and the Republic of Moldova signed a joint visa-waiver agreement Friday in which the two countries agreed to commit to the free movement of their respective citizens. His Excellency Dr. Kevin M. Isaac, St. Kitts and Nevis’ high commissioner to the United Kingdom of Great Britain and Northern Ireland, and his colleague, Vilen Murzac, Charge d’Affaires of the Republic of Moldova in London, toasted the occasion as a logical and important next step in the development of their countries’ relationship, having concluded a joint communique that established diplomatic relations on Sept. 8 last year. This agreement was inspired by the commitment of the government of St. Kitts and Nevis to strengthen relations with friendly countries, increase partnerships and facilitate easier travel of its citizens for business and leisure. 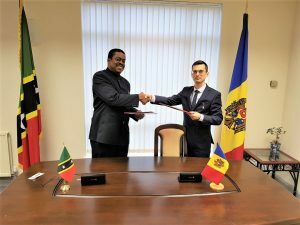 Upon completion of the necessary internal procedures, the agreement will enter into force ensuring that citizens of St. Kitts and Nevis and the Republic of Moldova who hold either a valid diplomatic, official, service and ordinary passport can enter, exit and transit each other’s territories without the need for a visa. They will be able to remain for an uninterrupted period of up to 90 days or for several stays of up to 90 days during any 180-day period. The agreement again conforms with the Unity government’s strategy and continuing commitment to deepening relations and to broadening its engagements with countries around the world. His Excellency High Commissioner Isaac conveyed the satisfaction of Foreign Minister Brantley that St. Kitts and Nevis and the Republic of Moldova, both small countries, have been able to work this quickly in fostering opportunities for cooperation and ease of travel, which he hopes will spur people to people exchanges. High Commissioner Isaac also expressed his willingness to see people from Moldova visiting the federation in the coming months and years, as well as citizens of St. Kitts and Nevis exploring business and leisure opportunities in Moldova. Both envoys again offered greetings on behalf of their respective governments and extended invitations for future ministerial-level engagements to progress the new friendship and advancing partnership.